If you took ‘Terror of the Autons’, stirred in elements of ‘Shada’ and then sprinkled it with bits of Educating Rita, the gumbo you produced would probably be nothing like ‘The Pilot’. But it’s a decent beginning. Because the keyword for this week is…well, not the much-anticipated ‘reboot’ that we’ve been going on about for months. You can see quite clearly what they were trying to do, but that oversells it. Have the BBC produced an episode that can be watched by someone experiencing the show for the first time? Perhaps, and by the skin of their teeth. Still, that’s not the vibe you take from it. This may be the most accessible companion-breaking story for some time, but it’s not ‘Rose’. 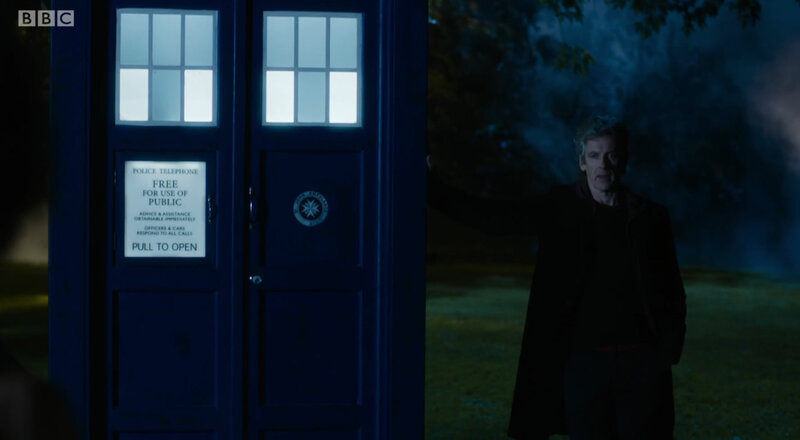 Doctor Who has too much history – even within its last twelve years – to be able to pull a stunt like that. No, the word you may be looking for is ‘grounded’. 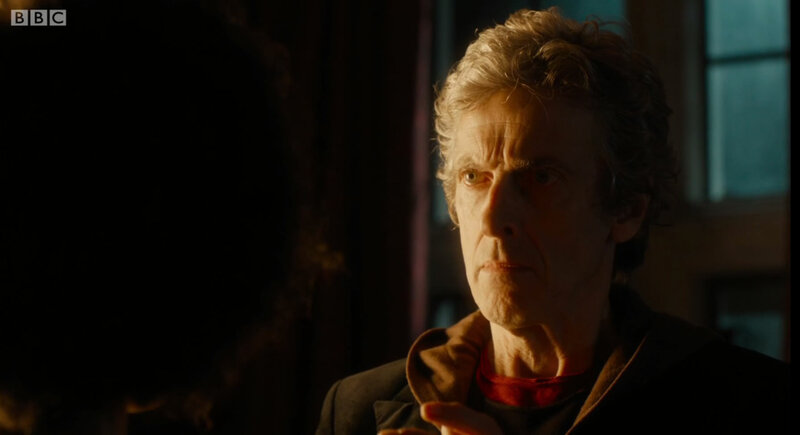 Because this is an episode that roots itself (to use Peter Capaldi’s own words) before you’re allowed to go anywhere. This is not a Doctor who turns up and comically integrates himself (or rather fails to) into a community, as we saw in ‘The Caretaker’ or ‘The Lodger’. This is a Doctor who’s already been on the scene a long time, who cannot possibly be as young as he looks, and who is visibly offended when people fail to point this out. But there’s more to it than that: this is not another ‘Snowmen’, in which the arriving companion breaks the Time Lord out of a funk overnight. It takes time. The Doctor’s tenure may be well-established but it still takes a good few months (read: minutes) for his new companion to discover what’s really going on. Not that this is in any way a bad thing. 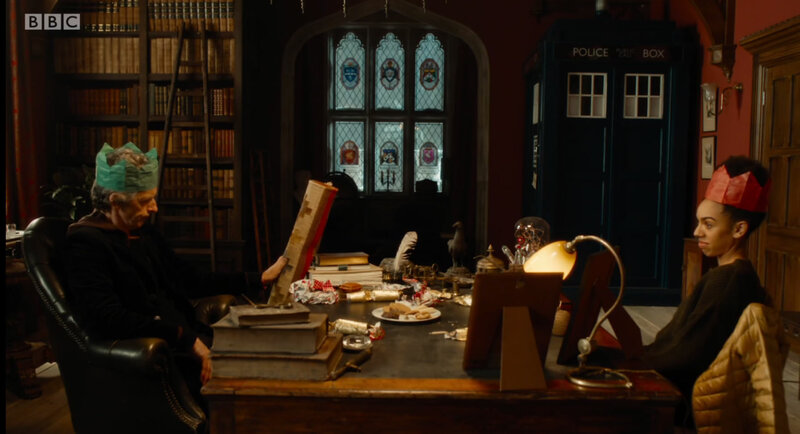 I was going to say that this was the most leisurely-paced episode of Doctor Who in years, but I was forgetting about ‘Face The Raven’ – a story in which nothing much happened for ages and which was horrifically boring as a result. In this instance what happens is a delicate dance between its two central characters – close and simultaneously at arm’s length – to the extent that by the time Bill finally sets foot in the TARDIS she knows the Doctor quite well, without actually knowing him at all. ‘You talk all the time,’ said Donna, one of the most perceptive of the NuWho companions, ‘but you don’t say anything’ – and while Capaldi’s Doctor is considerably less prone to the bouts of verbal diarrhoea for which Tennant’s incarnation was renowned, it’s not a bad comparison. 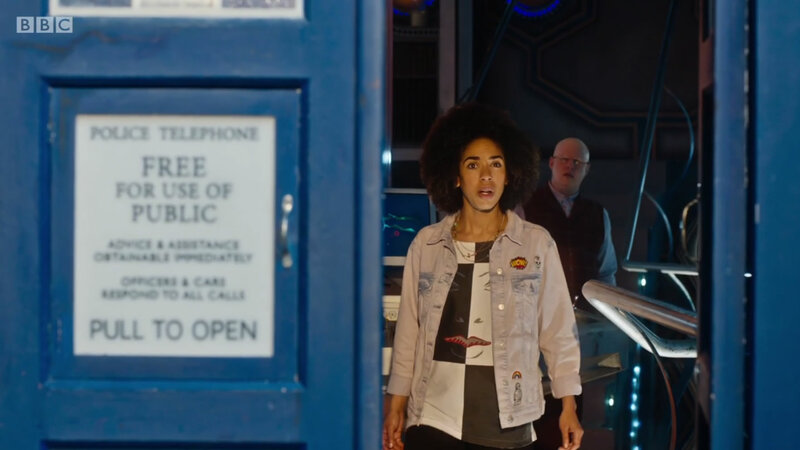 What is to all intents and purposes a two-hander turns into a three-hander the minute Nardole arrives on the scene properly (he appears briefly at the beginning merely to establish that he has a screw loose, in a quite literal sense). We’re told that he has a reason for hanging around but that’s clearly a card that Moffat is playing close to his chest for the moment, presumably having decided to throw it on the table just before he reveals the three aces he’s got stashed in his underwear. At least it’s fun to watch. 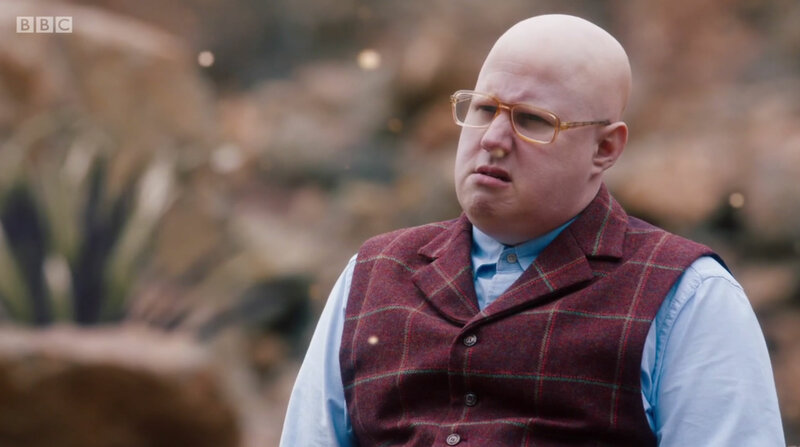 Matt Lucas may have spent half of his first episode stuck on top of a Power Rangers Megazord and half his second running around in search of a lavatory, but it is here – despite the reduced screen time engineered to favour Mackie – that he more or less shows his true colours, as a cowardly but largely competent valet, deviating between dry sarcasm and quivering cowardice; half Jeeves, half Penfold. There is a plot, of sorts, but you know that by now. It concerns a girl named Heather, who finds herself trapped in her own reflection, reforming to become the monster of the week: a dripping, frightening thing capable of clearing small pockets of the universe in a single bound. ‘Water always wins’, as the Tenth Doctor might have said, and while Heather lacks the cracked, jagged appearance of the Flood she is still reasonably sinister, if only by being so quick on the draw. It calls to mind the first Droopy cartoon, ‘Dumb-Hounded‘, in which the titular dog is sent in pursuit of a deadly criminal, who races from Chicago to Hollywood to the North Pole only to find Droopy waiting for him everywhere he goes. It takes a Dalek to bring down the reconstructed Heather, and it’s the episode’s dullest moment (although it follows a blink-and-you’ll-miss it shot of the Movellans, fumbling with laser guns in one hand and trying to play rock-paper-scissors with the other). It’s all very well surrounding Bill by images of the cosmos so that her mind is almost literally blown; it’s just a shame it had to be the story’s climax. Bringing up the pace only to immediately drop it to play mind games is seldom interesting, even when it’s closely linked to the idea of escape, and it makes for a tedious, lacklustre finale. But that almost feels like a minor quibble. This is an episode that works, largely because by and large it doesn’t try to do too much. The cast are a big help – Capaldi is comfortable and self-assured as the Doctor, and his support make the most of what they have – but the strength of ‘The Pilot’ lies in its concept of space, in a strictly terrestrial sense. 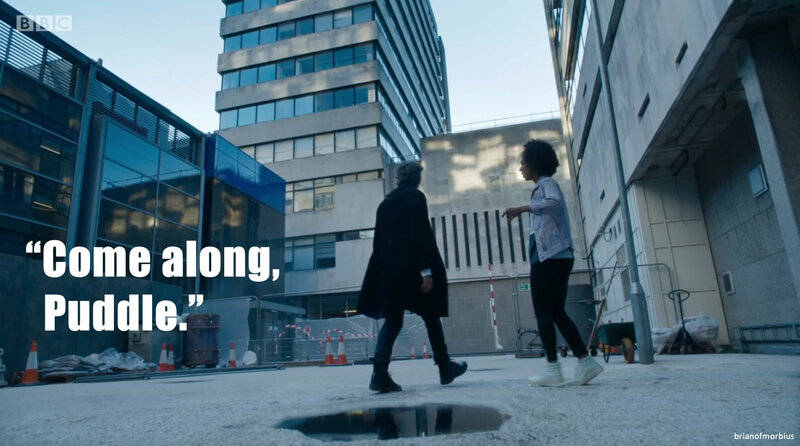 It introduces new characters and gives them breathing room – hence the Doctor and Bill are flung together not by impossible forces, but by a sense of mutual loneliness and the driving need to explore. By the time the Doctor has temporarily abandoned his plans to guard whatever it is he’s guarding in that vault and whisk Bill away to the stars (tellingly with a line that echoes Christopher Lloyd’s reckless abandonment of responsibility at the end of Back to the Future), it feels like an inevitability – and we cheer with her. Cast your minds back a year, and it’s no great secret that I was one of Bill’s fiercest critics. To be fair, all I had to go on was that the introductory scene they used to showcase her arrival. You remember, the one where she’s rude about the Daleks. To call it slightly asinine is like saying that The X-Factor occasionally plays with the truth. 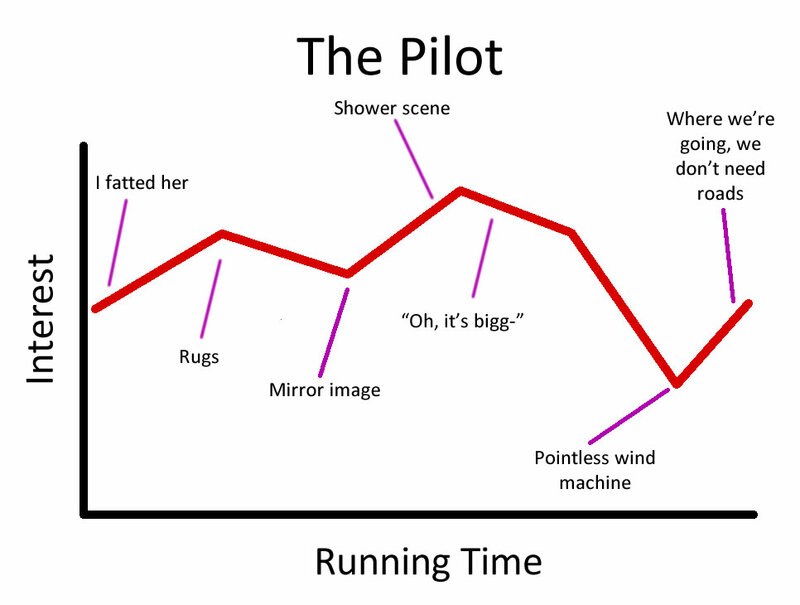 Within the context of ‘The Pilot’, we might think of it as her ‘Runaway Bride’ moment: a few people will laugh, while many more will simply roll their eyes. But it took seeing her in action to change my mind. Because it’s early days, but Bill really seems to fit. After the build-up, the preliminary interviews and a bunch of trailers that didn’t exactly do her any favours, I approached ‘The Pilot’ with a certain amount of dread, but it seems that I worried over nothing. She takes longer to get the hang of the TARDIS (“Is this a knock-through?”) than many companions, but I’m now convinced she’s absolutely the right person to be in it – and I can’t wait to see where it takes her, both geographically and emotionally, as the series plays out. And if I can manage that, so can you. I was fully prepared to be super grumpy about it, but I actually kind of loved it. I didn’t care for the Heather bits as much as the rest, but I enjoyed it rather more than I thought I would. No, the McGuffin wasn’t brilliant, but it wasn’t really about that – it was a character piece. What struck me most was how much I liked Bill. I am legitimately looking forward to getting to know her.